“Major Bridgewater, Why?” first appeared in the James-Younger Gang Journal. It appears here in a revised and enhanced edition. “They gutted my office pretty effectually.” So telegraphed Capt. William R. Gross to his Union superiors from the train depot in Danville, Kentucky. Gross further reported the guerrillas were under the command of a Capt. Clark, who identified his group as the Fourth Cavalry from Missouri, on their way to Washington to have a personal meeting with President Lincoln. Capt. Gross broadcast that Clarke’s band headed west for Perryville at 11:15 a.m.
From an earlier experience, Judge Speed Smith Fry of Danville learned not cotton to the idea of guerrillas, masquerading in Union uniform, especially in his town. Fry had earned his rank of Brigadier General at the Battle of Perryville He still retained his command of Danville’s Home Guards. 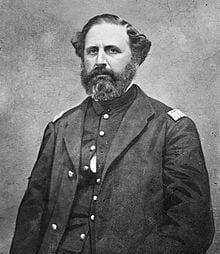 His ire raised again; Judge Speed Smith Fry now suspected Gen. Clarke of Missouri to be none other than William Clark Quantrill. With Danville’s Home Guards, Judge Fry gave chase from his home at Spring House Farm. He headed down the pike, eight miles to Perryville. 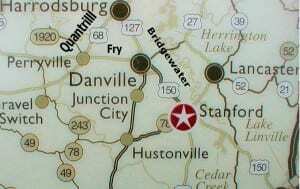 Four miles southeast of Danville, Maj. James H. Bridgewater received the telegraph message in Stanford, Kentucky. Bridgewater had been in the Union Secret Service, commanding scouts who chased Confederate guerrillas throughout central Kentucky. Only recently, Maj. Bridgewater had organized the Hall’s Gap Battalion of Home Guards. Most everyone in Stanford was a Southern sympathizer, who considered Bridgewater’s guards as being guerrillas themselves, not at all for the South but the Union. None of the Northern guerrillas was more nefarious than Maj. Bridgewater’s older brother Augden. Route of the chase by Fry and Bridgewater. Harrodsburg at the top. Stanford on lower right. Danville at center. 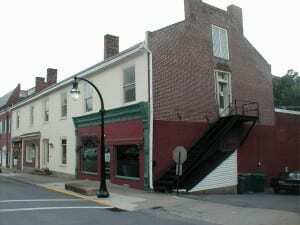 Perryville on the left. Upon the telegraph news, Maj. Bridgewater mobilized the Hall’s Gap Battalion and headed for Harrodsburg up the old buffalo trace, north of Perryville. Maj. Bridgewater assumed Fry would drive Clarke’s band from Perryville. Harrodsburg, a staunchly Confederate bastion of Southern sympathy, would be the guerrillas’ nearest destination of safety. Late in that cold and snowy night, Maj. Bridgewater found a detachment of the guerrillas four miles west of Harrodsburg. The band, including Frank James, Bob Younger, Allen Parmer, and the Pence brothers Bud and Donnie was concealed in the home of Sallie Ann Van Arsdale.7 Maj. Bridgewater would not wait for the break of dawn to commence slaughter. When Maj Bridgewater assaulted the Van Arsdale farmhouse full bore, with Kentucky rifles and keen marksmanship famed since the Revolutionary War and the War of 1812, the unforeseen force against Frank James and Quantrill’s men turned deadly. 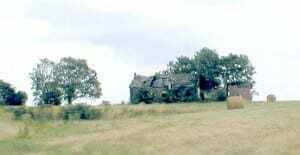 Elisha Farmer of Bridgewater’s Home Guard held position behind a field fence. Holding only a pistol, Farmer held his fire, waiting for a reachable and precise target. Bridgewater’s assault raged for ten or fifteen minutes, Farmer recollected. 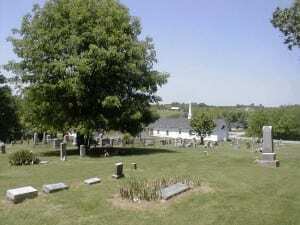 Oakland Methodist Church cemetery outside of Harrodsburg, Kentucky. Now the Oakland Christian Church. First burial site for Quantrill’s fallen. Numerous Van Arsdale and Sallee families are buried here. Quantrill lost nine of his forty-one men that night. Jim Younger and three others were captured. The arrested were ordered to bury Quantrill’s dead in the cemetery of the Oakland Methodist Church. In his retirement, Frank James returned to the scene later in 1889. 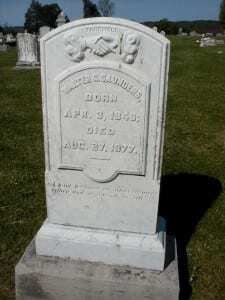 With the help of Col. Jack Chinn and his son Kit who lived on the other side of Harrodsburg, Quantrill’s fallen were exhumed and re-interred in the new Spring Hill Cemetery in the town of Harrodsburg. Spring Hill Cemetery had been dedicated to the fallen soldiers of the Confederacy. 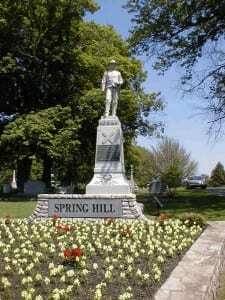 Spring Hill Cemetery, Harrodsburg, Kentucky, dedicated to the fallen of the Confederacy. 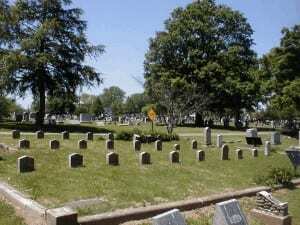 The plot in Spring Hill Cemetery where Frank James and Col. Jack Chinn reinterred those of Quantrill’s Raiders who fell under the assault of Maj. James H. Bridgewater. Ten days later, Maj. Bridgewater struck again at 2:00 a.m. west of Hustonville where Quantrill had been spotted. On this occasion, Bridgewater killed four more of Quantrill’s band. The balance fled barefoot in the snow when Bridgewater captured all of their horses. In Kentucky, Quantrill never gained more distance on President Lincoln than Georgetown, Kentucky. Lincoln soon was killed on April 15th. On May 10th, Quantrill was shot up and left for dead in the farm field of Dr. James Heady Wakefield in Nelson County. Quantrill had taken refuge there. When alerted to the shooting of Quantrill and his being severely wounded, Frank James was found reading a book he had picked up while in Danville. In a Louisville hospital, Quantrill got religion. He was baptized a Catholic like the Youngers. Quantrill then expired on June 6th. Frank James retreated to a home on the railroad tracks not too far from Samuel’s Depot, where he and Quantrill’s band surrendered on September 26th. Frank James then was paroled. Before the Civil War in Stanford in 1858, James H. Bridgewater and his brother Augden had been members of the Lincoln Lodge No. 60 of the Free & Accepted Masons.11 At that time, Stanford elected Bridgewater as Sheriff. When Bridgewater ran for election to the state legislature, his popularity faded, and he was not as successful. 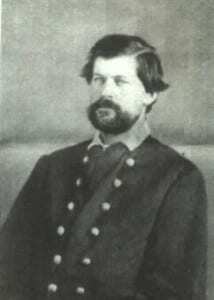 On July 17, 1867, an assassin’s bullet brought down Maj. James Bridgewater. Previously, twenty-seven-year-old Walter G. Saunders made an attempt on Bridgewater’s life. Bridgewater’s brothers and nephews repelled Saunders when they appeared in the street carrying Spencer carbines. 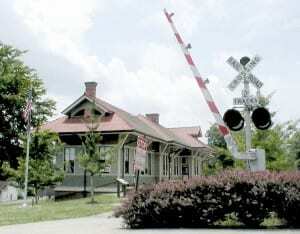 A subsequent attempt against Bridgewater occurred on Danville Avenue in Stanford at the crossing of the Louisville & Nashville Railroad. On July 17, 1867, however, Bridgewater was playing cards in a saloon. Saunders appeared again with four men of his own. They chased Bridgewater to a stairwell where they killed him. Ever since the assassination of James H. Bridgewater, candidates for Sheriff’s office in Stanford, Kentucky customarily demonstrate their Southern sympathy. His Masonic Lodge buried Maj. Bridgewater with Masonic Rites.14 He is presumed buried in an unmarked grave near his father-in-law Abraham Dawes outside Stanford on Howell Lane, off Route 127 at the foot of Hall’s Gap. Immediately adjacent and across Howell Lane lay buried the enslaved of the Dawes family. One issue remains unresolved in the saga of Maj. James H. Bridgewater’s pursuit of Quantrill, Frank James, the Younger brothers and especially the Pence brothers. With Maj. Bridgewater murdered and buried, Bridgewater’s widow and children departed Kentucky with Sarah Pence-Dawes, Bridgewater’s mother-in-law. They moved to Missouri, first to Warrensburg in Johnson County about 20 miles southeast of Kansas City. They subsequently removed to Nevada in Vernon County.15 One of Bridgewater’s sons settled in Kansas City. Also living in Missouri in Pettis County was Rebecca Younger, a first cousin of Bob Younger whom Bridgewater captured. Bridgewater cousins of the Major proceeded to live among Rebecca Younger’s nieces and nephews there. Maj. Bridgewater’s mother-in-law is Sarah Pence, who removed her family to Nevada, Missouri.16 Back in Stanford, Kentucky, the parents, nieces, and nephews of Sarah Pence-Bridgewater stayed to continue populating Lincoln County. Today, they lay buried in Buffalo Springs Cemetery outside Stanford. Sarah and her Pence family, like Maj. Bridgewater’s wife Susan Dawes and Bridgewater’s children, are cousins of Bud and Donnie Pence, whom Bridgewater hunted to kill on his chase to Harrodsburg. The question left unsettled no doubt in the mind of Maj. Bridgewater’s widow, as well as for history, is – Maj. Bridgewater, why? 1 Sanders, Stuart W. “Quantrill’s Last Ride.” America’s Civil War Vol.12. March 1999, p.42-48. 2 Brown, Richard C. A History of Danville and Boyle County, Kentucky, 1774-1992. Danville. Bicentennial Books. 1992. p. 41. 3 Louisville Daily Courier, March 1, 1862. The text of the full letter addressed to “Gen. F. K. Zollicoffer,” is reproduced. 4 Interview with Col. Speed S. Fry, 4th Kentucky Infantry, to the Editors of the Louisville Journal. Danville, Kentucky, Feb. 23, 1862. 5 A year before the battle, King had written to his neighbor Capt. Isaac Singleton, whose son was hanged with King’s two sons. Letter of Capt. Harbert King to Capt. Isaac Singleton, dated, “Camp Robinson, Kentucky, Oct. 16, 1861,” in possession of King descendant Madelene Henley. 6 Obituary. Lafayette Advertiser, Lafayette, Louisiana. September 2, 1893. p. 6, col. 5. 8 Author’s interview with Robert Hamlin, great grandson of bourbon distiller Taylor William Samuel 1821-1898, the brother of Dr. Reuben Samuel. Danville, Ky. March 18, 2004. 9 Author’s interview with Jack Farmer at age 76, great-grandson of Elisha Farmer. Stanford, Ky. June 16, 2007. The attack pistol remains in the possession of Jack Farmer. Jack Farmer has since deceased. 10 Hale, Donald R. We Rode with Quantrill, self-published 1975. ed. 1982, p. 147. 11 Records of Lincoln Lodge No. 60 of the Free & Accepted Masons, confirmed by Chaplain David Gambrel in preparation for the Bridgewater dedication service. 12 Rhyne, J. Michael “A Murderous Affair in Lincoln County: Politics, Violence, and Memory in a Civil War Era Kentucky Community” American Nineteenth Century History, Volume 7, Issue 3, September 2006, pp. 337 – 359. 14 Records of Lincoln Lodge 60. 15 1870 Census. Johnson County, Hazel Twp. Missouri. Also, 1900 Census. Vernon County, Richland Twp., Missouri. Jesse James, Lost Treasure, & the Golden Circle – Where’s the Beef? The author claims he has a BA in Journalism, and a Ph. D in Biblical Archaeology. He also claims to have been a Professor at UCLA and Los Angeles City College and to have been a technical writer of Pilot Handbooks for numerous Aerospace Companies for years. Maybe-so ——but none of those qualifications are apparent in this 81 page (8 ½ x11”pages) book. Further 24 of those pages are either filled with full page photos or illustrations or left entirely blank. 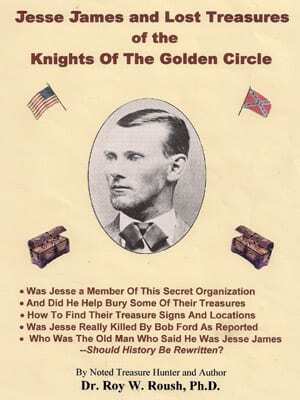 There are no notes, no bibliography and no evidence that the author has any acquaintance with any serious history of either the Knights of the Golden Circle or of Jesse James. The author was associated with Del Schrader, a reporter, who wrote, Jesse James Was One of His Names [see this reviewer’s article, “The Ten Most Bizarre Books About Jesse James “, in the August 2010 WWHA Journal.] Orvus Lee Howk aka Jesse James III was another associate of the author of this book. The first part of the book centers on the Knights of the Golden Circle (KGC). It is stated that the KGC was organized in 1835 by Senator John C. Calhoun and others in Lexington, Kentucky. All of the literature I have read on the KGC credits George Bickley as the founder. So far as I can determine, John C. Calhoun had nothing to do with the KGC. Bickley started it in Cincinnati in 1854 as a filibustering society. By 1860 the KGC was used to promote secession. The author claims the KGC survived the War, planned to finance another Civil War, collected treasure of all sorts toward this end, and etc. etc. Jesse James is, of course, a member of the KGC and hid some of the treasures for the group. We are then treated to all sorts of hints about how to locate the treasures, and warned that some of the treasure is guarded by sentinels and booby trapped. Bob Ford did not kill Jesse James. As evidence the author presents a blow-up of a photo of Ford where he claims Ford has his fingers crossed. This is said to be proof that he did not shoot Jesse James. There are a couple of pages of drivel trying to prove that Zerelda Samuel lost her left arm, not her right arm, when the Pinkertons raided the James-Samuel farm in 1875. The real proof of the pudding is the man in Lawton in 1948—J. Frank Dalton! Several J. Frank Dalton photos are reproduced, including the one of him posing with Al Jennings. J. Frank Dalton’s name is explained as follows” The “J” stands for “Jesse”, the “F” for “Frank”, his brother, and the “Dalton” from his mother’s maiden name—nice deduction since her maiden name was Cole. One other ridiculous claim was to state that the James and Younger boys were first cousins and their mothers were sisters. The mother of the Youngers was a Fristoe. Utter nonsense! Give this one a pass unless you collect such stuff. Jesse James’ Secret: Codes, Cover-Ups & Hidden Treasure by Ron Pastore and John O’Melveny Woods, (Intellect Publishing. 2010). 296 pp., soft cover, $19.95. This is another round of Jesse James did not die in 1882. Like most other books and articles of this ilk this one is loaded with misinformation and fairy tales. There are no notes, no bibliography, or any other pretense of real research. The book is also replete with photographs of very dubious identification and origin. Jesse James was really Jeremiah (or was it Jere Miah—the authors can’t seem to keep the spelling consistent) James. Jeremiah lived on well after Jesse James was shot and killed by Bob Ford in 1882, raised a large family and died in Kansas. Even well documented facts concerning the James and Younger families are totally twisted in this book. For instance the father of Robert James (the father of Frank and Jesse) is said to have died on a buffalo hunting trip to Indian Territory. In fact, both of Robert James’ parents, John and his wife Mary (Polly), both died in Logan County, KY in 1827 and there are extensive court records that document this. The authors claim that the James boys and the Younger boys were cousins and this is not true. The authors also list the following Youngers as members of the James-Younger gang: Bud, Cole, Bob, Jim and Grat. Bud was a nickname for Cole Younger and there was never a Grat Younger. Grat was a Dalton and a member of the Dalton Gang. The Daltons and the Youngers were, however, related. I could go on for several pages just listing errors of fact in this book but that would do little but document the complete lack of scholarship of the authors. The entire book is more tall tales of Knights of the Golden Circle, buried treasure, switched identities, etc, etc. Unless you wish to collect all of the weird books in print about Jesse James I would advise you skip this one.